The most significant contribution of the Sufi poets of the Punjab is their rising above the narrow and parochial concepts of religion and laying emphasis on the love of God alone. They believe that the love of God can be attained through the love of man. 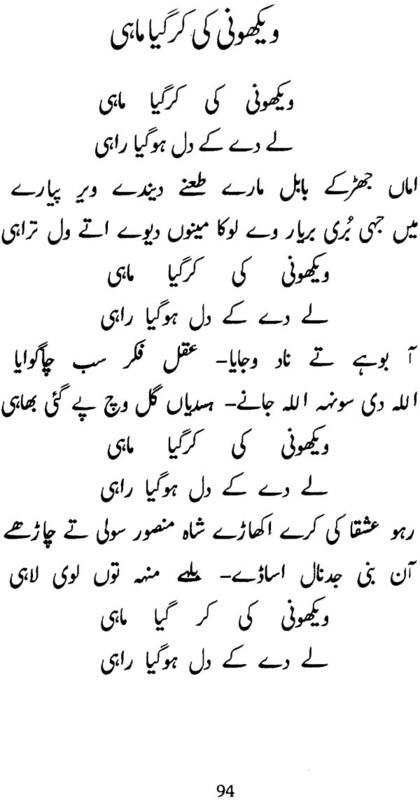 Sain Bulleh Shah is the most important voice among them. The rational and socialistic content of his verse, more importantly his sympathy with the have-nots and the down-trodden speaks volumes for his forward-looking vision. His romantic defiance of both Hindu and Muslim bigotry and ritualism is particularly telling. 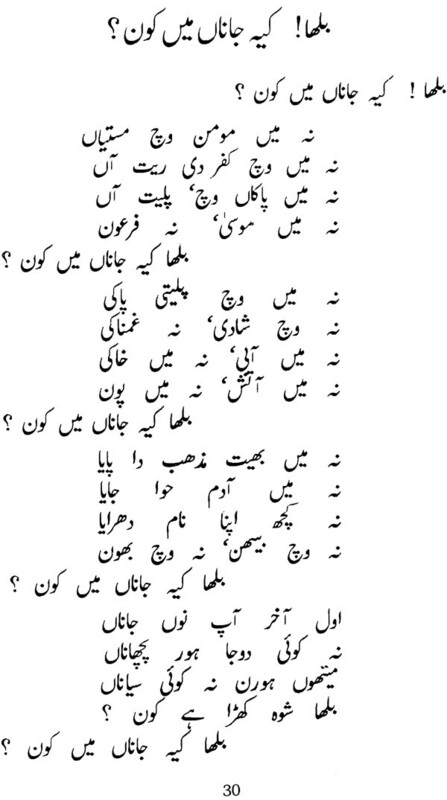 Bulleh Shah Fostered communal amity and understanding which is the primary need of our times ridden with blind fundamentalism and petty political considerations. 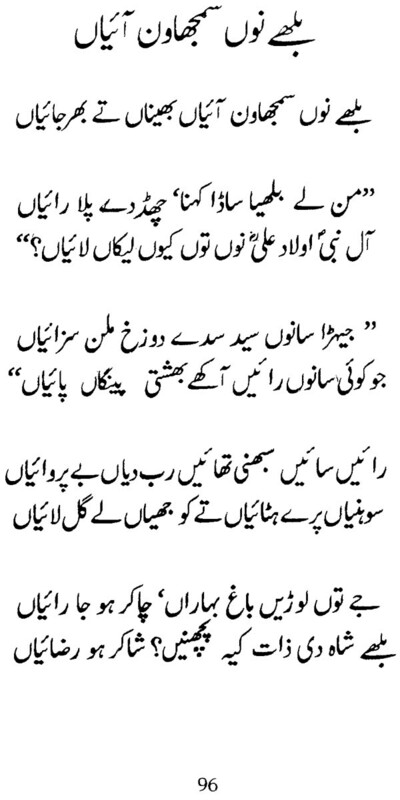 It is a pity that no authentic version of Sain Bulleh Shah's work is obtaining. All that has traveled to us is from mouth to mouth. It, therefore, varies from Persian script to Gurmukhi script, from Pakistan to India. This may, at times, be evident from the text covered in these pages. The English translation is based on Gurmukhi script prevalent in India while the text in Persian script is that available in Pakistan. Kartar Singh Duggal (born 1917) is one of the leading Indian writers. Decorated with Padam Bhushan by the President of India and soviet Land Nehru Award for totality of his contribution to the Indian literature, he is author of more than 500 short stories available in 22 collections, 10 novels, 2 collections of poetry, 7 plays, over 50 short plays, an autobiography in two volumes and several works of literary criticism in Punjabi. Equally proficient in Urdu, Hindi and English, he translates his works into these languages as and when called for. Some of the other honours conferred on him are: National Academy of Letters' Award for Punjabi Short Story, Ghalib Award for Urdu Drama and Bharatya Bhasha Parishad Award for Fiction. Mr. Duggal was awarded the Degree of Doctor of Literature (Honoris Causa) by the Punjabi University and the distinction of Sarva Sreshta Sahityakar by the Punjabi Sahitya Academy in 1994. having served as Director, all India Radio, Director, National Book trust, India and Adviser (Information), Planning Commission, he is currently devoted to literary activity exclusively. The Sufi cult is akin to mysticism. It is believed in some quarters that it was born out of interaction between Semitic Islam and Aryan Vedantism on the soil of India. This is not the whole truth. Sufism took birth in Arabia in the ninth century. However, the Aryan perceptions in Iran and then in India influenced it a great deal, more particularly in accentuating the emotional content as against the dry-as-dust self- denial of the Arabs. The Arabs laid stress on asceticism and disciplining of the body, while the later Sufis in Iran and India, under the influence of Greek philosophy, Platonic ideology, Christian faith, Vedantist thinking, Buddhist lore, etcetera believed in leading an emotionally rich life. They drank and danced and advocated that physical love could sublimate itself into spiritual love. They had faith in God; they loved the Prophet but they maintained that the Murshid or Guru could also lead to realization of the Divine Reality. (a) God exists in all and all exist in God. (b) Religion is only a way of life; it does not necessarily lead to Nirvana. (c) All happenings take place as per the will of God; nothing happens if He does not ordain it. (d) The soul is distinct from the physical body and will merge into Divine Reality according to a person's deeds. (e) It is the Guru whose grace shows the way and leads to union with God. (a) Leading a disciplined life as prescribed in Islam (Shariat). (b) Following the path delineated by the Murshid or Guru (Tariqat). (d) On realization of truth, getting merged into Divine Reality (Marfat). The practitioners of the Sufi cult came 1'0 India following the Muslim conquerors, more with a view to propagating Islam. There came to be established several centres at Lahore, Pakpattan, Kasur, Multan and Uch in the Punjab. However, the most popular sects among them were those which combined in them the best of every faith and promoted it amongst the people. 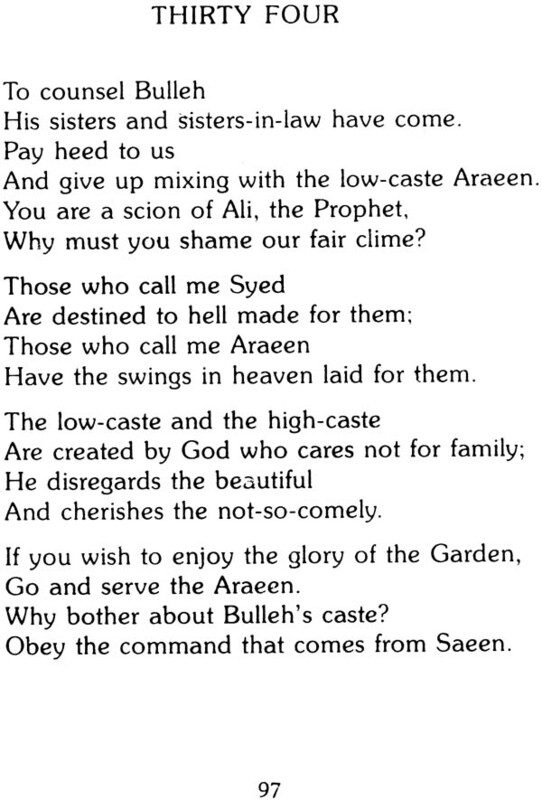 Bulleh Shah, the noted Sufi poet, belongs to this group. The Sufis loved God as one would love one' s sweetheart. God for a Sufi is the husband and humankind his wife. Man must serve, love. undergo asceticism, gain enlightenment and then get merged in God. The Indian Sufis laid stress on repeating the Name (Japu), concentration (Dhyan) and meditation (Habs-i-dam). A Sufi must eschew sin, repent, live a simple and contented life and should look for the grace of the Murshid or Guru. The Sufis maintain that the soul has been separated from the Divine Reality and the supreme mission of human life is to achieve union with God. Like the Iranian Sufis who sang the praises of Yusaf Zulaikha, Laila Majnun and Shirin Farhad, the Sufis in the Punjab idealised the romances of Heer Ranjha, Sohni Mahiwal and Sassi Punnun. Preoccupied with the metaphysical, they restored the use of symbols drawn from everyday life around them like the spinning-wheel, boat, dowry, etc. As poets, they employed kafi, baramah, athwara, siharfi, doha, baint and deodh as their favourite poetic forms. Their language is simple and conversational, light and lyrical. There is no denying that they made an indelible impression on the life and thought of the people of the Punjab. More important among the Sufi poets who wrote in Punjabi were Shah Husain (1538- 1599), Sultan Bahu (1629-1691), and Shah Sharaf (1640-1724). They were preceded by Farid in the 12th century and followed by Bulleh Shah (1680- 1757), Ali Hyder (1690-1785), Hashim Shah (1735- 1843) and others in the 17th and 18th centuries. More important among the Sufi saints who influenced life in the Punjab were: Data Ganj Baksh. Sheikh Farid Shakarganj, Qutbuddin Bakhtiar Kaki. Moinuddin Chishti, Nizamuddin Auliya, Mian Meer and Sarmad. Are destined to hell made for them. Have the swings of heaven laid for them. Nevertheless, according to A.N. 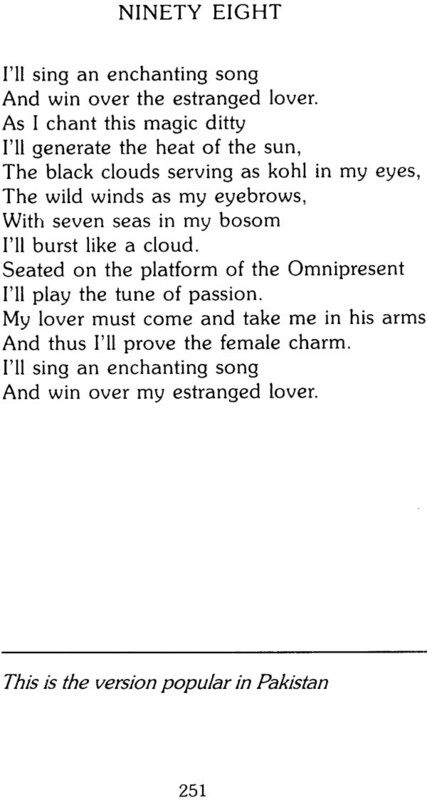 Walker, Bulleh Shah's sister had to pay the price for it; she remained unmarried. 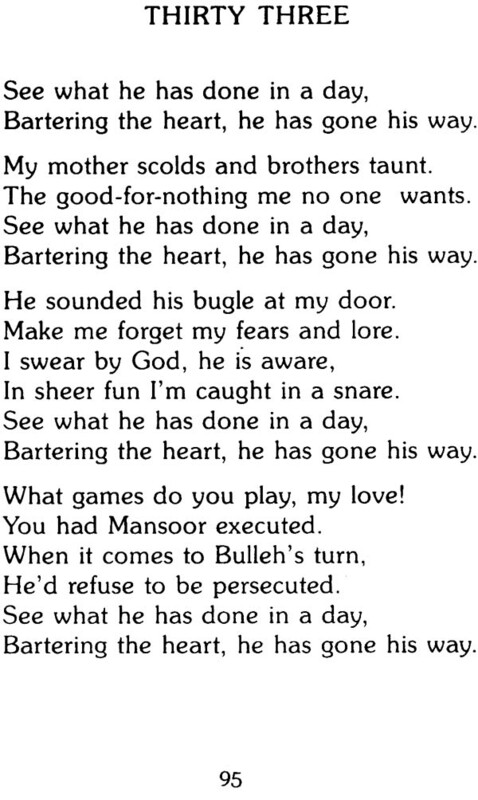 In 1729 when Shah Inayat died, Bulleh Shah succeeded him as' the master of ceremonies in the monastery at Lahore. 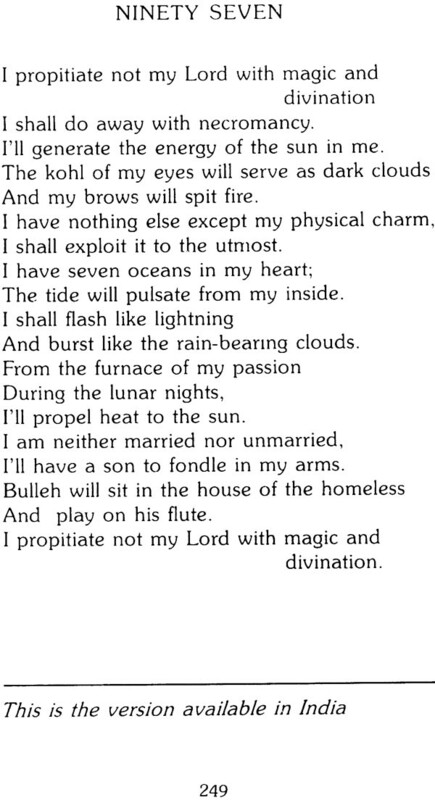 According to the epitaph on his tomb, Bulleh Shah died in 1757. He never married. 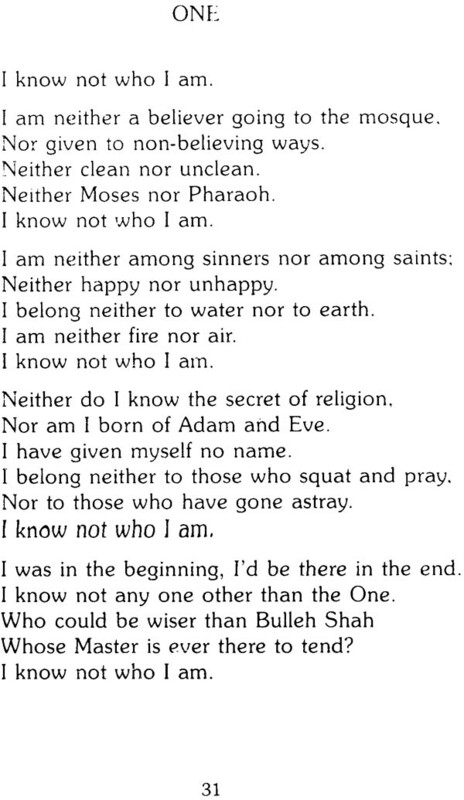 A semi-literate Punjabi peasant, Bulleh Shah's search for truth led him on to the spiritual path. And it is when he started enjoying the beauty of truth that his emotional exuberance drove him to Sufism: singing, dancing and finding expression in verse. However, neither did he care to prepare a Divan nor did he or anyone else ever record the story of his life. His poetry has travelled to us from mouth to mouth mainly through Qawwals. Similarly, his life has come to us in the form of anecdotes, some of which are reflected in his verse. Maybe it was due to the fact that the Punjab was greatly disturbed between 1710-1750. If there were any MSS, they must have been lost. It was only in 1882 that' one Malik Hira collected his compositions and brought them out from Lahore for the first time. This clinched the issue. 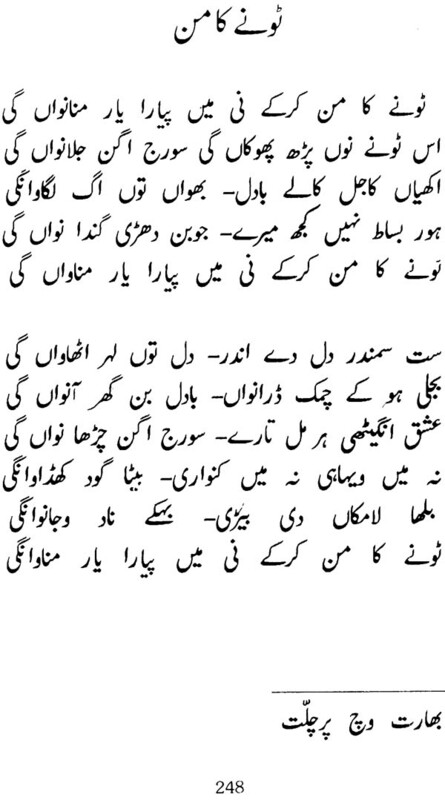 Bulleh Shah became a disciple of Inayat Shah.